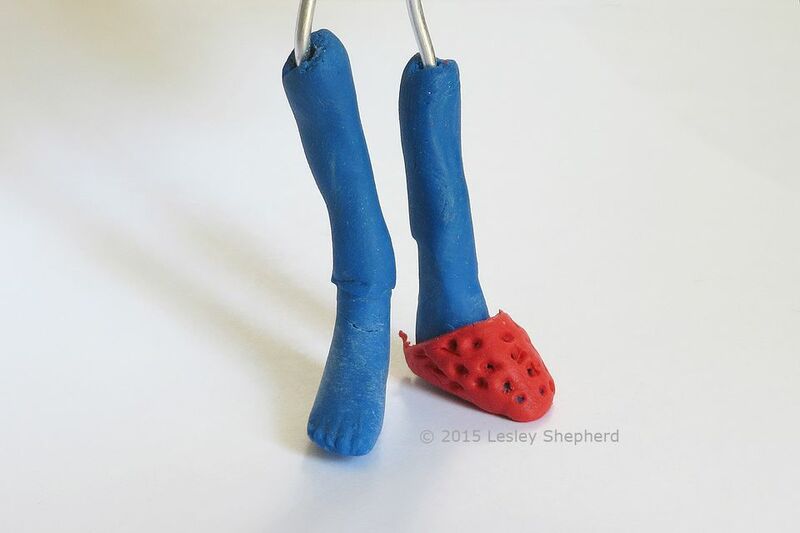 How to Make Simple Polymer Clay "Lasts" for Doll Shoes. Make Simple Polymer Clay "Lasts" for Doll Shoes. If you want to make a variety of shoes for your doll, you should make a copy of your doll's feet and lower legs to act as a 'shoe last' or former to shape the shoes on. This keeps your doll's feet free of glues and other materials and allows you to glue, trim and shape your miniature shoes on accurate shapes sized to fit your doll, without worrying about harming the doll's feet. Shoe lasts for dolls can also be set in more comfortable working and bracing positions than can the doll while parts of the shoes dry. The simple lasts shown here were made using waste polymer clay and a simple mold of the doll's feet using two part silicon putty. For larger dolls or more accurate molds for tightly fitted shoes you may want to use dental plaster for the main last instead of polymer clay, which in some formulations can shrink. For the most accurate molds, you will want to make two part latex molds or poured silicon molds, which require more work and more specialized tools. To make the lasts easier to work with, I added a short length of aluminum armature wire to the leg section of the last. This can be bent and held in a vise or pliers to make it easier to angle the surface of the last while working on the shoes. To make custom shoe lasts for your doll first make simple molds of your doll's feet. If you have an expensive doll who's "skin" might be discolored by silicon mold putty I suggest you wrap the feet in cling film before using the putty. You may also want to take casts from "extra" feet instead of the feet currently on the doll. Commercial production dolls generally have identical feet between models. If you can find discarded feet or broken legs you may be able to use those for your molds instead of your best doll. Prepare your doll's feet by brushing on a thin layer of talcum powder or corn starch (corn flour) to act as a 'resist' for the silicone mold putty. Silicone putty rarely sticks to the plastics, resin and porcelain used for dolls, but it is best to be safe! Note: If you are making a mold of a doll which has moveable or jointed ankles, you should cover the ankle mechanism with tape or cling film (or remove the feet) before making a cast. You don't want the casting silicone to get into the ankle mechanism. Mix a sufficient amount of two part mold putty to cover your doll's feet and lower legs to the height you want for your shoe last. If you have a choice, use the most stretchable mold putty you own (generally blue putties are softer and stretch more than the purple type which is firmer). If your doll has very narrow or wide ankles you may want to extend the last to take in that part of the doll's foot and leg. Set the mold putty carefully around the foot of the doll, making sure it is pressed securely against the doll's toes, instep, lower ankle, and heel. Gently press the doll's feet squarely down on a flat surface so the bottom of the mold will be flat. Use a polymer clay blade or something similar (the edge of a ruler) to open the back of the mold against the doll's heel and leg as shown.This will allow you to easily remove the doll's feet once the putty is set. It is much easier and safer to do this when the putty is still soft instead of waiting until the putty is set. If your putty layer is thick enough, mark the front of the molds with "L" and "R" to signify left and right feet for future reference. I marked these out on my molds with the end of a pin, taking care not to press the pin in too deeply. Set the doll and the mold putty aside for the putty to harden. Once you are certain the mold material has set (it will take longer on the inside of the mold, so leave it longer than normal!) gently open the slits on the back of the doll's feet as shown, and carefully slip the doll's feet backwards out of the putty mold. This is where a gently application of talcum powder or corn starch (corn flour) is helpful, especially for dolls with very detailed toes. With the doll's feet removed from the molds, clean the feet carefully to remove any residue of the mold putty oils or the talcum powder / corn starch / corn flour you used as a resist. If you didn't make marks on the molds before the putty set, use a permanent marker to mark "R" and "L" on the molds for future reference. The next step in making custom shoe lasts for your doll is to soften or "condition" some waste polymer clay . Use the softest type of clay you have for this project. It will fill the mold much easier than firmer types of clay. (comparison of brands of polymer and air dry clay) If you prefer, you can also use dental plaster from the art supply store to fill your mold. In this case you will need to tape the back of the mold along the slit where you removed the doll's foot before you fill the mold with plaster and leave it to harden. Plaster of Paris could also be used, but dental plaster is much harder and will last longer. If you only have firm clay don't worry, there are ways to fix the cast by adding in additional clay and re-baking. I suggest not using liquid clays as they tend to shrink more than soft or firm clays (firm clays usually shrink the least) Although the shrinkage isn't a problem for the fit of most doll shoes, having a smaller last than the shoe size you want to make could be a problem for some styles. When you have your clay softened and conditioned. roll it into a cylinder or "worm" about the same width as the doll's ankle. Gently feed the clay into the toe of your mold, pressing it in carefully to completely fill the mold. If you wish, leave the roll of clay above the mold to make a bit of a leg and add a piece of wire or armature wire into the clay to help secure the leg and give you a way to easily clamp or manoeuvre the shoe last when it is finished. Carefully squeeze the back of the mold so the slits are closed, removing any excess clay that sticks out of the back of the mold. Bake the clay in the mold at the temperature range suggested for curing your clay. Leave the molds to cool before you attempt to remove the initial polymer clay shoe last. When the polymer clay has cured and cooled in the silicone putty foot mold, carefully remove it through the back slit in the mold. Check the initial polymer clay "cast" against your doll's foot (see photo this page) to see if it duplicated the detail of your doll's foot. If not, see how to fix problems in the next step. In my initial "cast" of the foot for my doll, the polymer clay didn't reach the end of the mold and the detail of the doll's toes was missing. This was noticeable as the foot was shorter than the doll foot and had less detail. To fix problems where your clay has not filled the mold, blend a small amount of clay to the first 'cast' after it has been cured in the oven. Try to blend the new clay in to match the outline of the doll's foot (see photo). When you insert the foot with the soft uncured clay back into the mold you don't want there to be so much extra clay that it pushes the mold out of shape. Once you have the foot shaped correctly, set it back carefully into the mold (aren't you glad you marked them "R" and "L"?) pressing the mold gently down around the new soft clay. Re-bake at the suggested temperature for your particular clay brand. The cured pair of shoe lasts will likely have some seam lines or at least a "seam line" down the back of the foot where the mold was cut to allow the foot to be easily removed. Use sandpaper wrapped around a pencil to make a sanding block and sand away any seam lines or lines where two layers of putty blended. Check that the base of the foot on the last is flat and sand it if necessary. Take care when sanding to 'wet sand' using damp sandpaper in order to avoid polymer clay dust. Never sand polymer clay in poorly ventilated areas. Use a dust mask when sanding the clay. Checking the Final Shoe Last Against the Doll's Foot. The final step in checking the shoe last is to compare it to the doll's foot to make sure it is as accurate as possible. Make sure that the 'arch' of the foot, the heel and the toes line up against the doll's foot. Also check that the angle of the top of the foot to the ankle is correct. As a test of your finished shoe last, make a simple pair of fabric slippers or a pair of Mary Jane shoes to check the last will work for your doll. A good test of a finished last is to make a pair of Desert boots / Ankle boots / Chukka boots for your doll.